For self and wife. Wife's birthplace given. Resource for Women, African American and Alien Research? Of course by now you know passport application can be a genealogical treasure. They give us place of origin, parent’s names, date of birth, photos, and so much to fill in holes and to karate chop a brick wall to its knees. But, sometimes we need to delve a bit more into the law and practices of this document. Like all collections, passport applications have evolved over the years. An interesting fact is that not all passports were issued by the Department of State. Prior to 1856 other government entities were allowed to issue passports, and the issuance of passports were governed by fluctuating laws. But, the Department of State began issuing passports in 1789. At that time ninety five percent (95%) of early passport applicants were men, but not 95% of the travelers. Self, servant, and two minors. If the man was being accompanied by his wife, children or servant, the group, customarily were named and traveled on one passport. The group travel scenario makes for a genealogical bonus. Women and children also traveled overseas, sometimes alone or accompanied by a woman’s maid, child nurse or family servant. In these cases passports can be used to verify a family unit. By 1923, 40% of the passports applicants were women. It is rare that researchers think of passports as a resource for African American research for ex-slaves. 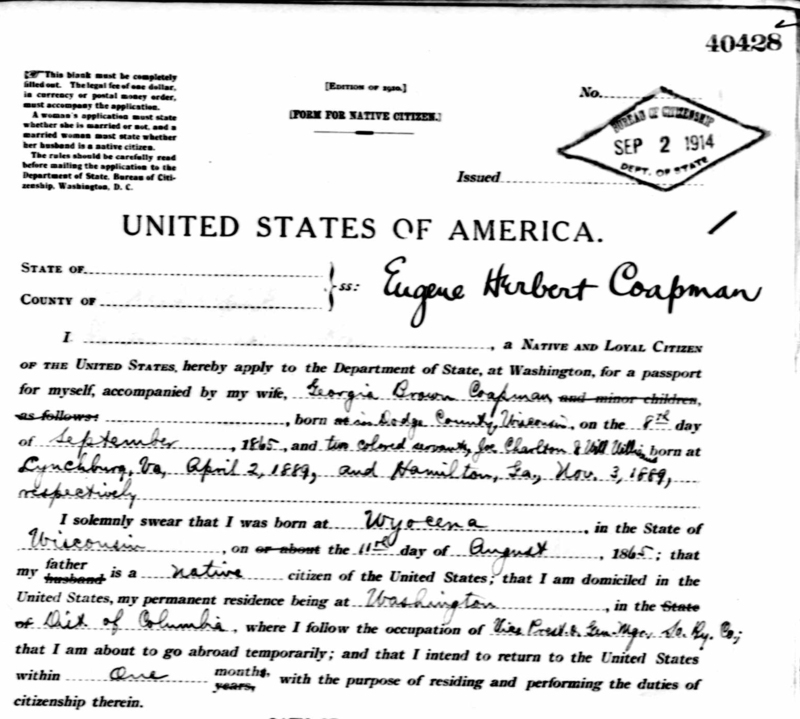 But recently, Beth Foulk of Genealogy Decoded provided the example above of Eugene Herbert Coapman. She came across this passport application, that clearly defines two colored servants, when researching her husband's line. 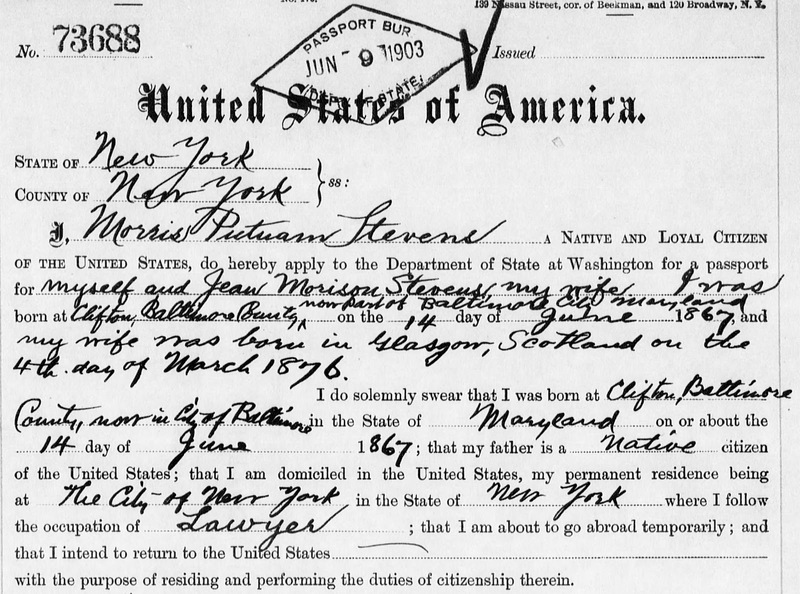 As in this example, early passports may provide genealogical glimpses of servants, ex-slaves, or free coloreds, offering birthplace and dates of birth. Passports may also specify trade/occupation. Of course aliens were not “generally” issued passports, but this should not deter the researcher from reviewing the passport collections. 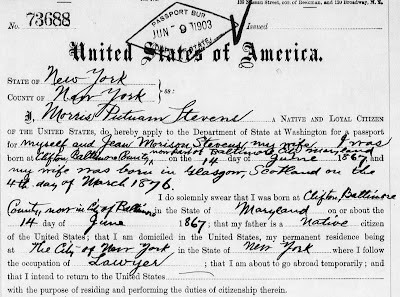 You may find your alien ancestor was one of the few issued a passport without being naturalized between March 1863 and May 1866. During this timeframe it was lawful to issue a passport to alien applicants if they had completed their Declaration of Intent to become a naturalized citizen. (Reference: Act of Congress of March 3, 1863 (12 Stat. 754; and Act 30 May 1866 - 14 Stat 54). 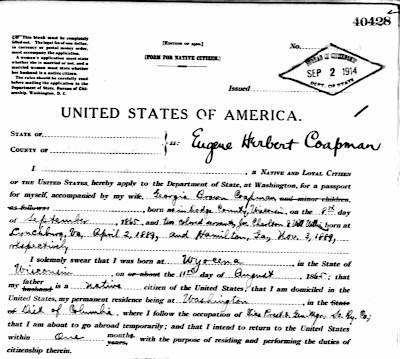 It was once again lawful to issue passports to aliens between 1907 and 1920, if the applicant had declared his intent to become a naturalized citizen. (Reference: Act 2 March 1907 - 34 Stat.1228; and June 4, 1920 - 41 Stat 751). WWI Era: President Woodrow Wilson's Executive Order 2285 of December 15, 1915 recommended passports: But they were not required until May 22, 1918 (40 Stat. 559). This was enforced until the 1921 treaties. WWII Era: The Act of June 21, 1941 (55 Stat. 252) once again imposed passport requirements. On the 27 Jun 1952 the Immigration and Nationality Act made it illegal to leave the USA without a valid passport. Excellent information...who knew there was such a thing as a "group passport!" thanks! Am I Really Native American?